Simply Pierogi is your trusted partner in foodservice. We offer top-of-the line gourmet pierogi that are authentic, delicious, and easy to prepare. We understand the need for simplicity, therefore, our products are simple to prepare and are made with only simple, natural ingredients. Simply Pierogi wholesale products are distributed nationwide to an array of commercial restaurants, universities, grocery stores, health care facilities, and more. Our authentic, gourmet pierogi are the perfect addition to your menu and our variety of traditional and vegan flavors are guaranteed to satisfy everyone’s taste buds. 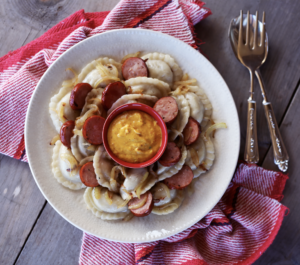 Interested in learning about the versatile menu options you have with pierogi? Check out our recipe page to get some menu inspiration for your business. Pierogi can be served as an appetizer, main entree, and even dessert! They can be prepared in a variety of ways in order to accommodate any type of cuisine. Stand out from the rest with Simply Pierogi. To provide authentic, old-world pierogi recipes with a modern day flair. To provide a product that is simple and quick to prepare without sacrificing taste.